Wanting to push snooze after a full night of sleep, feeling overwhelmed and irritable, experiencing body discomfort and joint pain, and feelings of mental and physical exhaustion — these are all signs of fatigue. In 2010, fatigue was named one of the top five health concerns in WebMD’s annual Year in Health survey. Physical, psychological, and social stress are all contributing factors. So instead of reaching for the candy bowl or a triple shot espresso, here is a yoga sequence that sparks the internal flame to help boost your energy immediately. Kapalbhati translated from Sanskrit is “skull illuminating” and is a fiery breathing exercise that increases the breath rate through forceful exhales. During the exhales, there is a tendency to make a hissing sound and it can be helpful to think of all the stress and fatigue leaving the body with each hiss. The increased breath rate is subsequently linked to increased metabolism and improved respiratory flow. Fiery breathing even for just five minutes can boost energy immediately by improving energy utilization and breath flow. Warrior Pose is named Virabhadrasana, which translates from Sanskrit to “hero friend pose” and its namesake, Virabhadra, is a fierce warrior creation from Shiva, the supreme ruler of the universe. Warrior I is Virabhadra’s blazing arrival with swords in both hands, Warrior II is his preparation stance with gaze on his rival, and Warrior III is his swift and precise attack. The series channels the inner fiery warrior and ignites concentration, passion, and devotion to boost energy immediately. Without tending to the flame, it can dwindle after prolonged stillness and neglect. Especially for individuals working desk jobs or who sit still for prolonged periods of time, the body's normal response of contracture (shortening and hardening of muscles, tendons, or other tissue) becomes a hindrance on energy flow through the body. Releasing tension from the hips, neck, spine, and shoulders helps unblock the body. The body becomes stimulated and energy is boosted immediately. In Sanskrit, Chakra can be translated to wheel or disk which references the wheels of energy in the body. While there are 114 chakras in the body, focus tends to be on seven main chakras that align with the spine from the base to the crown of the head. In the chakras, energy can become unbalanced and energy flow can become congested in different areas. 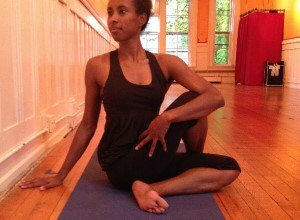 Wheel Pose invites strength and stretch as well as heart opening to energize and release the body from tension. Additionally, because in this pose the small adrenal glands located on top of the kidneys are squeezed, Wheel Pose helps the body release stress and stimulate energy into the body. Savasana is the ultimate pause button to tend to the inner fire. It kindles the internal flame by allowing the body to relax and refocus the energy inwards to the core. Challenge to incorporate both the amazing benefits of coffee and Savasana: try a 20-minute coffee Savasana instead of a 20-minute coffee nap. Focus on first unwinding and then notice when the heart rate starts to pick up and the mind becomes more energized. It is easy to be normalized to fatigue and to keep placing self-care at the end of the to-do list. This practice refocuses on tending to the internal flame to help boost energy immediately! Feel free to modify and add onto the practice with suggestions below.